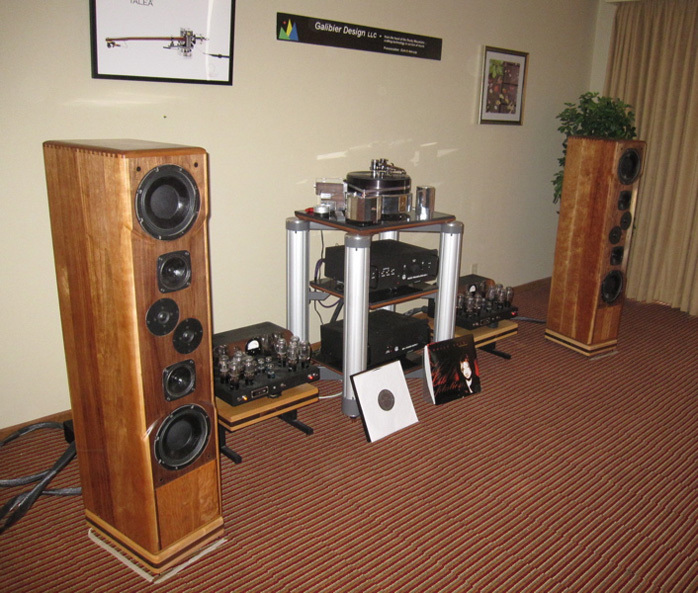 In my top tier of best-sounding rooms and definitely the winner for small monitor speakers was the Audiomachina exhibit. A Modwright-modified Oppo BDP-83 Special Edition Blu-ray Player, Modwright LS 100 preamp and Modwright KWA 100SE amplifier fronted the Audiomachina CRM two-way sealed box compact reference monitor. I played the Kari Bremnes cut Montreal and it was the best I heard it reproduced at the show. It was rich and detailed with lots of bloom. My notes say "pretty incredible". What was striking too was the high level of intelligibility combined with tremendous smoothness and ease. In my experience this type of sound only comes with a very phase-coherent crossover design as well as solid enclosures. The latter was obvious since the cabinets were machined from solid aluminum stock. Upon request the larger three-way CRG speaker model was connected for us to hear but I have to say that I preferred the two-way CRM. The CRG apparently is still not a completely finished design. 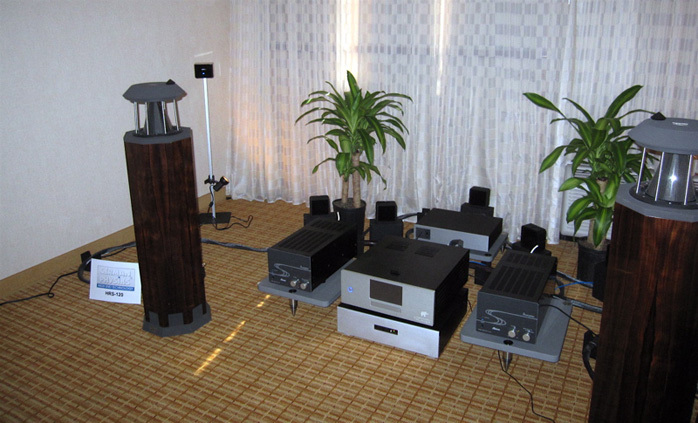 One of the Laufer Teknik rooms, 1122, was playing the omni-directional German Physiks HRS 120 speakers with brand new Abis Shuhgetsu series electronics from Japan. This was a radical improvement over the sound of the German Physiks speakers the last time I had heard them. Buffer Ergmann informed me that the Abis electronics were quite special. Stein Harmonizers were also in use. Having heard about these acoustic devices before in conversation with Buffer, I asked to have them turned off while we were listening. The results had me shaking my head as well as Bill who was sitting next to me. We clearly heard the soundstage shrink by about 50% in all directions. I have a set of these on loan now from Laufer Teknik and hope to get them set up as soon as I finish this report. In the Galibier Design room, their Stelvio-II turntable ($27,500) was mated with Durand Talea tonearm, a Dynavector XV1-S cartridge, Atmasphere MP-1 preamp and M-60 amplifiers powering the Daedalus Ulysses loudspeakers (substituted for the listed Green Mountain Audio speakers which did not show up). A Holly Cole LP was playing when we entered. I noted great bass and a dead quiet background. Bill pulled out his Pete Townsend record and we played Pinball Wizard. We both felt that this room did the best job on this record of any room. The energy and speed of Townsend’s guitar virtuosity was well reproduced and conveyed much of the excitement of this live performance. Other selections played were equally impressive. This same room served as the venue for a "non-shootout" word-of-mouth invitation demonstration of the Schroeder and Talea tonearms on Saturday evening. Thom Mackris of Galibier Design was master of ceremonies for the occasion and took great pains to emphasize that the gathering was not meant to declare a winner but rather to showcase the different flavors of two world-class tonearms. Some were visibly frustrated with this approach as the opportunity to scientifically compare two world-class tonearms is not an everyday occurrence. Indeed such a comparison was not possible as the two tonearms had different cartridges mounted on them: the Dynavector XV-1S on the Talea and the Soundsmith Sussuro on the Schroeder. Additionally the cartridges were fed into two different phono stages. 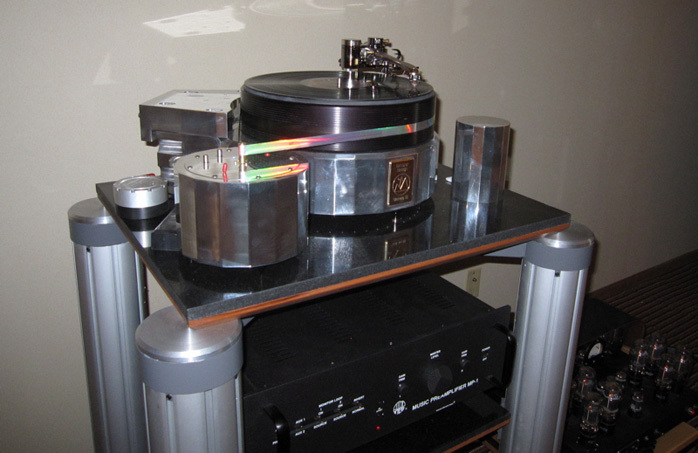 The Talea/XV-1s played through the Atma-sphere's phono stage and the Schroeder/Sussuro played through the Artemis/Jackson phono stage into the line stage of the Atma-sphere. Frank Schroeder and Joel Durand each brought LPs of their own choosing and each LP was played with both tonearm/cartridge/phono stage rigs. My overall impression of the comparison was that the Schroeder rig provided a richer and more robust/weighty sound with plenty of warmth and air. The Talea rig had more delicacy, more information and was more transparent. On the Ravel LP selection the Talea rig handled the crescendo a bit better, with more separation and greater blackness between the notes. Who knows how much of these qualities were attributable to the tonearms versus the cartridges and/or phono stages? I can see a listener preferring either presentation as demonstrated this evening. Talking to some attendees of this demo the next day, some expressed dismay at the lack of scientific method. Being a trained scientist, I must confess that I sympathized with this viewpoint. However, I still appreciated the effort involved in this event and thank everyone involved for a pleasant time. On to the fourth floor we heard another high value speaker, The Clue from Sjofn HiFi. For those who lament the dearth of speakers such as the old Linn Kan that are designed for placement against the wall, you would be wise to pay attention to this speaker. They were only $999 a pair at the show but I heard Lyle Lovett reproduced through them with great coherence between the drivers, a strong presence and pleasing harmonic balance and decay. These would appear to be a no-brainer recommendation for those on a budget and in tight quarters.